I was thinking where do all our guests come from after I read a recent post on a Linkedin forum I belong to that said they get folks from all over the world. The first post to the forum said they are hosting people from Germany in their Dutch B&B. That prompted others to reply with some of their visitors' place of origin: France, Spain, New Zealand, Taiwan, Japan, Poland, to name just a very few. Well, Lucinda and I have known for some time we get visitors from around the world; so to prove that to myself, I spent a little time reviewing our computer's guest data base and sure enough we have had people stay with us from: Netherlands, Belgium, Germany, France, Poland, Japan, New Zealand, Australia, Switzerland, Canada, Taiwan, England, Ireland and a few other places that we don't have complete information in our data base. One of the Murder in Fair Play events with the party goers at the height of fun. One of the mystery players is from London. I mention this only because meeting people from around the world was one BIG reason Lucinda decided she'd like to do a bed and breakfast. She wanted to have a diversity of guests. We both worked in environments that had many fellow workers from different parts of the world and the people we dealt with were from a large diverse group. The Linkedin post I mentioned also said they had started or bought their B&B's because they wanted they same thing. Most of those B&B's in the posts were in areas that we think would be great places visit: France, Belgium, Netherlands, England, Germany, South Africa, Brazil, Belize, Costa Rica and many more. 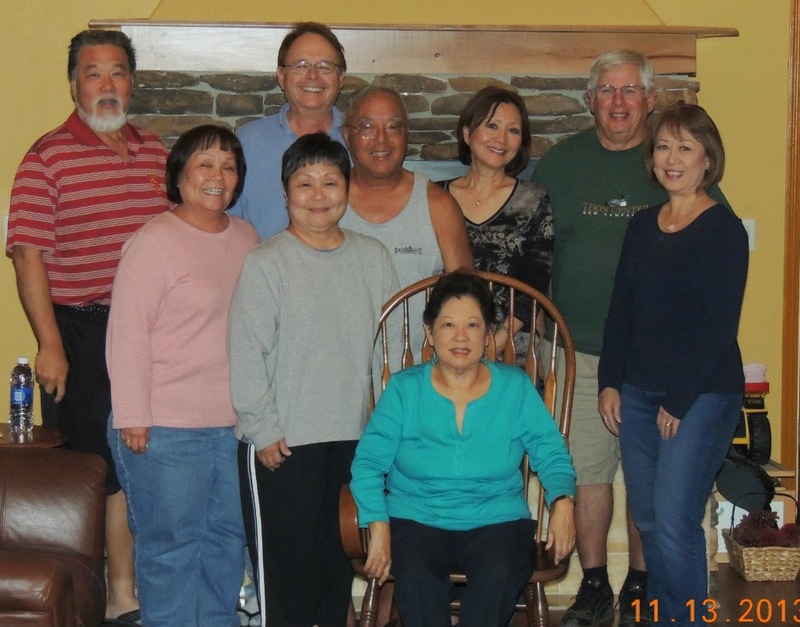 A group from Hawaii with several ancestral backgrounds. It is great fun to be with them. The point of this is really quite simple, our lives are rich with friendly people from all over the world. With this mixture of societies and personalities we all have a great time in the great room here at Lucinda's Country Inn. We didn't have life long dreams of doing Lucinda's, but when we got the bug we knew it would be a perfect match for us. We have loved our experience here at Lucinda's and we continually strive to make your experiences wonderful. The friendships and great people we have shared tales with is unbelievable. Just last Friday a Naval Aviator of 27 years was with us. He told me he was the flight commander for the flight over Libya in that late 1980's raid with two KIA's. He's had over 5,000 hours in Navy flying machines and has made more than 1,000 carrier landings. I was enthralled with that because I wanted to be a fly boy when I was much younger. Unfortunately I became to old for flight school, as all the schools were closing admissions in 1973. Oh well, I lived through Wayne's stories last Friday.